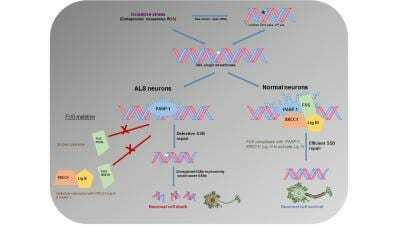 HOUSTON-(Oct. 31, 2018) – Houston Methodist researchers have discovered a repair defect in nerve cells that send messages to the brain, opening the door to a possible therapy for preventing or slowing down ALS. Also known as Lou Gehrig's disease, ALS is a terminal illness marked by rapidly progressive muscle weakness that ultimately affects a person's ability to swallow and breathe. Led by Muralidhar Hegde, Ph.D., and Haibo Wang, Ph.D., the team described their findings in an article titled "Mutant FUS causes DNA ligation defects to inhibit oxidative damage repair in Amyotrophic Lateral Sclerosis" in the Sept. 11 issue of Nature Communications. The new pathway they uncovered suggests that a DNA Ligase-targeted therapy may prevent or slowdown disease progression. Other researchers collaborating with Hegde and Wang on this paper were Joy Mitra, Pavana Hegde, Bradley Eckelmann and Sankar Mitra from Houston Methodist; Wenting Guo, Tijs Vandoorne and Ludo Van Den Bosch from Leuvan Brain Institute, Belgium; and Alan Tomkinson from University of New Mexico.